A travel desk is something that’s been on my Amazon wishlist for quite some time. I’ve never really though that I couldn’t live without it, so I didn’t buy it. Boy, was I wrong! My child is in love with this thing and it saves my ears from screams of boredom from the back seat. 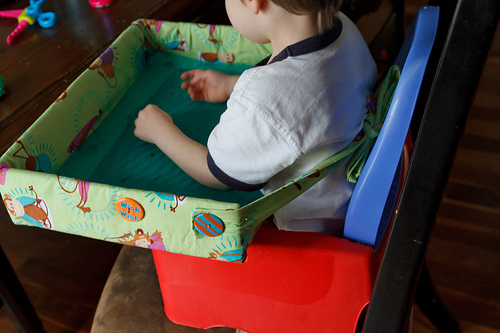 And, I’ve discovered this can be used as a makeshift high chair tray in a pinch! BEST PART: This is practically no sew. I say practically because near the end my hot glue gun broke (and this was just after I bought eleventy billion glue sticks). 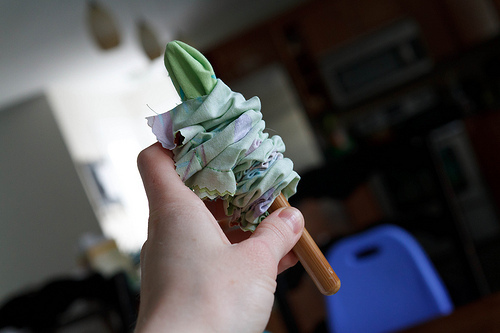 Just my luck… However, you can make this a new sew project, piece of cake. 1. 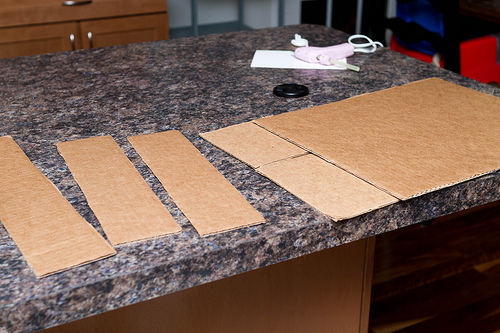 Measure & cut the cardboard for the size that you want your desk. The large lap piece measures 16.5″ x 12″. You want two of these to make it sturdier. The side pieces measure 3.5″ x 12″. And, the back piece measures 3.5″ x 16.5″. 2. Hot glue the two lap pieces together, one on top of the other. 3. 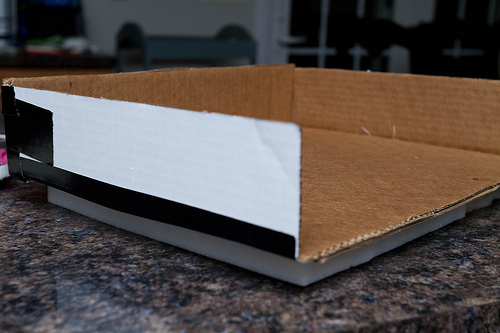 Cut the foam to fit the large piece of cardboard. My foam is about an inch shorter than the cardboard on all sides. Why? Because that’s the size piece I had left. 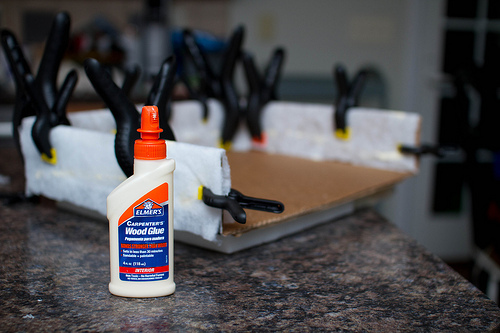 Glue the foam to the cardboard. 4. 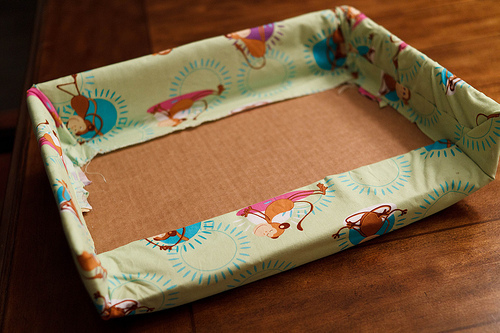 Flip it over and duct tape the side pieces onto the board, creating walls for the tray. 6. 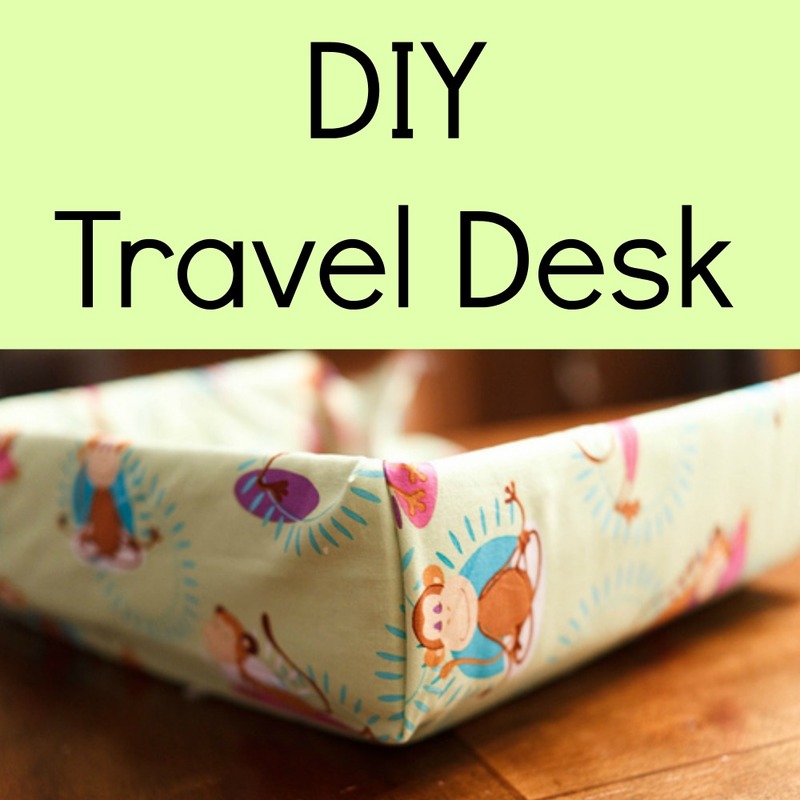 Lay out your fabric and place your desk on top of it. 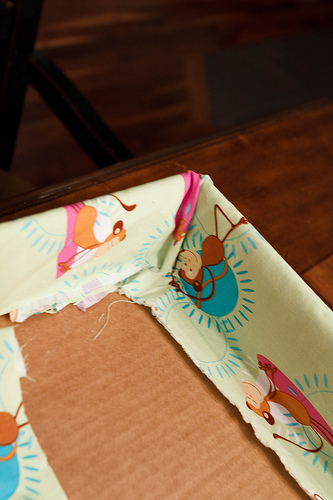 Fold the fabric over the desk to measure how much you will need to cover the walls into the lap piece. 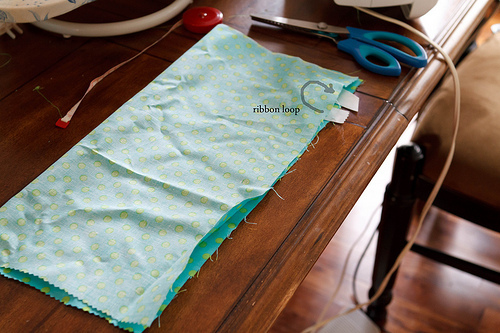 Cut excess fabric. My piece measured 34″ x 26″. 7. I cut slits in the fabric so that it would be easier to fold. 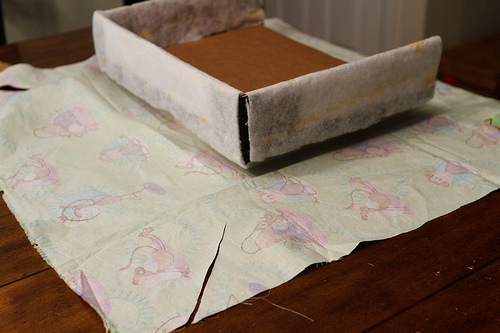 I folded the fabric onto the box like a present about one inch or so into the actual desk space. Hot glue at the top of the walls, at the inside corners and at the edge of the fabric. 8. 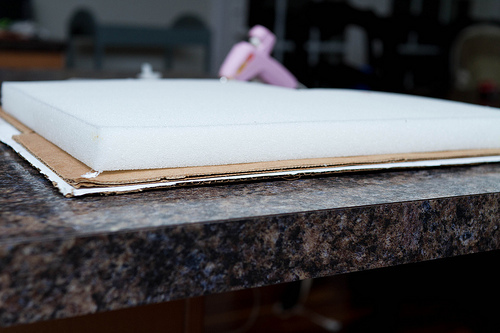 Take your plastic folder, cut it to fit the top of the desk and glue it down. This gives you a wipe-able, waterproof surface in case you’re using it for snacks. 9. The sewing part: Stitch the large buttons onto the desk. Two of them need to be near the front edges as you will be attaching a tie to it. The other two will be placed a little further back to hold pencil/toy pouches. Push the needle right through the cardboard. This will help hold the buttons on. 10. Now we’re going to make some fabric ties. This is where my glue gun decided to get stopped up and wouldn’t pump the glue through any longer. I’m sewing from here on out but feel free to replace any stitches with lines of hot glue. Cut two strips of fabric 24″ x 4″. 11. Fold them in half with right sides facing in. They should be 24″ x 2″ now. Iron them flat. 12. Stitch (or glue) along one short side and the long side. 13. Push them right side out. 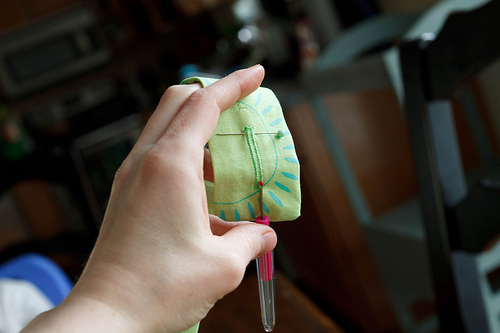 TIP: Use a knitting or crochet needle to force the fabric right side out. 14. Stitch (or glue) the open end closed. 16. Attach the ties to the desk. (See last photo for how the desk ties to your little one). 17. 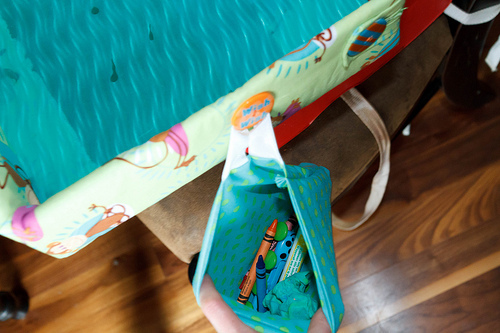 Now we can create a pencil/toy pouch to hang from the other button. 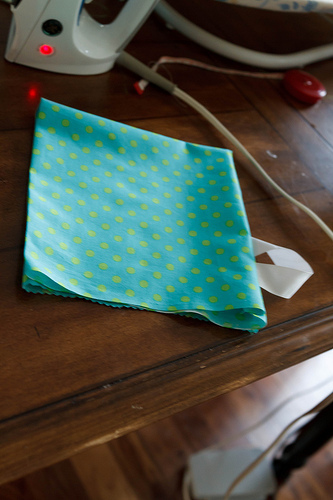 Use a 6″ piece of ribbon (mine is 1″ wide) and a piece of fabric approximately 14″ x 14″. 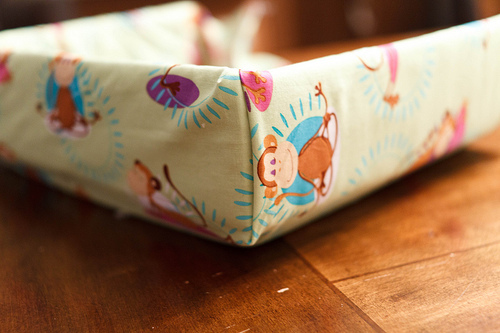 It can be slightly smaller but I wouldn’t go larger because it will be difficult for your child to reach into. 18. 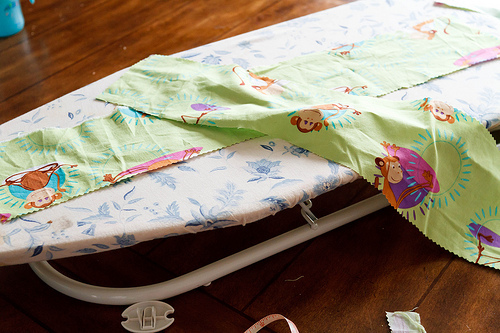 Fold the fabric over right sides in. Make a loop with the piece of ribbon and let the tails stick out. The loop can be placed anywhere along the top. If placed in the middle, the seam of the pouch will be facing outward. I’d place it about 1/4 of the way in from one side (which is not what is pictured). 19. Stitch (or glue the side) and turn the fabric right side out. 20. Stitch (or glue) along the bottom and up the side. You will have rough edges on the inside of this pouch. 21. Turn the pouch right side out so the edges are inside. Hang your pouch from one of the buttons. Voila! You’re a crafting whiz! Jacqie is a stay at home mom to two beautiful & adventurous little boys. She’s a former science teacher and recently opened a photography business. These are absolutely amazing ideas. Thanks so much for sharing. I love the print you used. 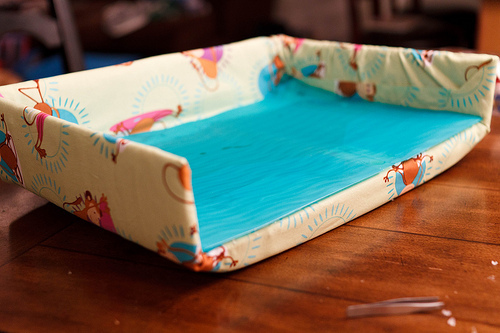 One could also use large cardboard fruit trays and remove the one panel which would be next to the tummy. And then cover with soft batting. Lovely colorful playmats can be used for the tray insert too. 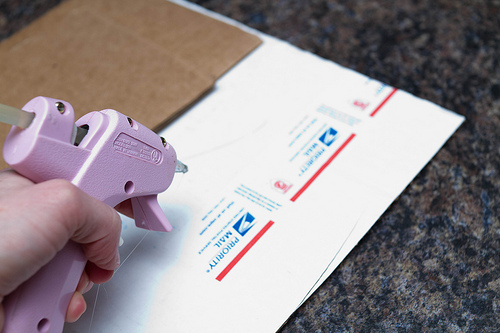 One could also use waterproof material which is easy to clean/ wipe up any spills. I want to make 3 for my kids and 3 for my neices too. I’m so excited.